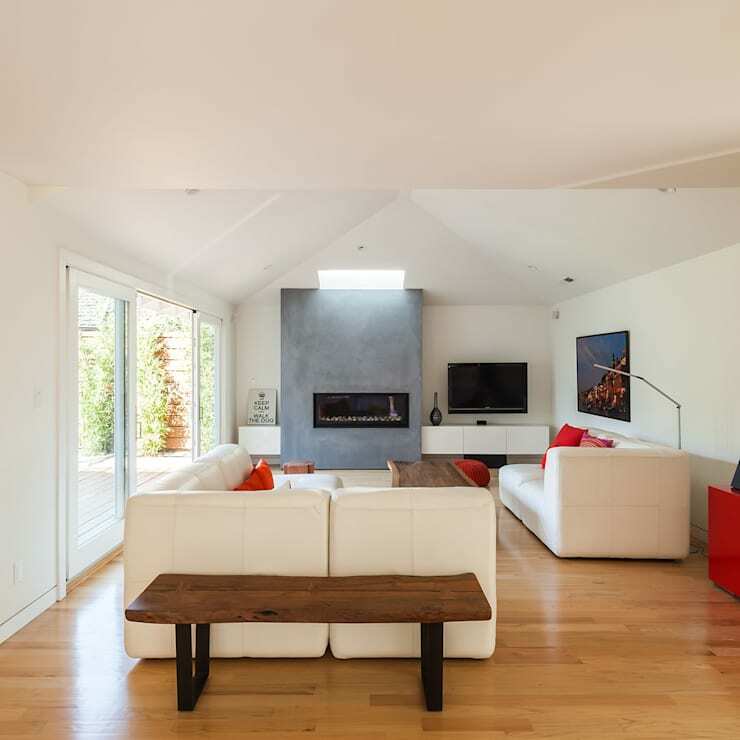 Travel through this modern family home in Palo Alto, California from behind the lens of photographer Antonio Chaves, exploring the energetic, cheerful, and natural atmosphere instilled in the interior of this sunny home. Chaves works with various styles of photography, from panoramic to corporate to architectural (and beyond! ), but in this tour, he captures all of the artistic details and unique perspectives that you can find inside of a well-designed and thoughtfully decorated home. Keeping a characteristically low profile, this Palo Alto home is a traditional sight amongst the dense pines, shrubs, and palms that closely surround the house. 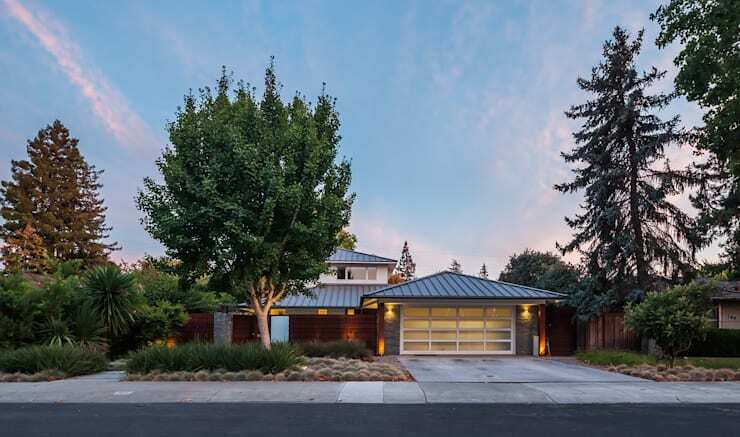 A front fence in a reddish wood provides privacy from the neighborhood street, while the garage takes on an unusually friendly appearance with plenty of glowing, translucent windows. A modern style dominates the design aesthetic of the space, with hints of an organic or natural theme in many of the rooms. Here, the living room practically glows in a smooth white, the furniture and walls reflecting the rays of California sunlight as they enter at an optimal angle through the large patio windows. Medium tones in the floor and chimney bring depth and grounding to the room, while little bursts of red add a funky, playful sense to the otherwise sophisticated space. A notable design feature in this room is the skylight located directly over the fireplace, which turns the mantle into a visual highlight regardless of whether or not it’s aglow with fire. 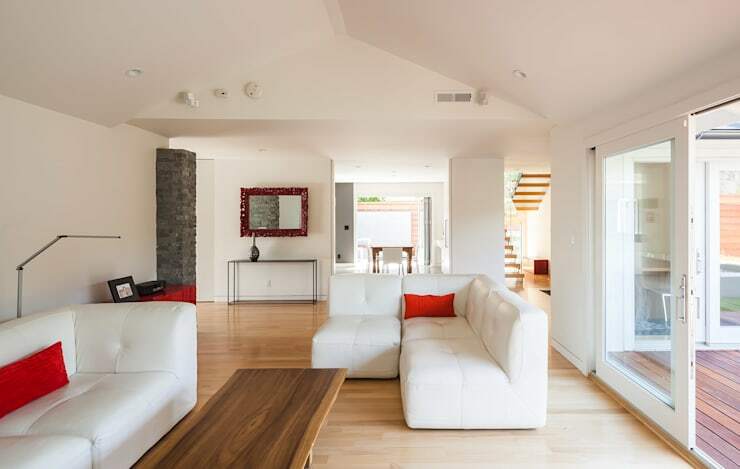 A view into the home shows a central spot where many of the common areas intersect, showcasing the wide open space that’s been incorporated into the generous floorplan. 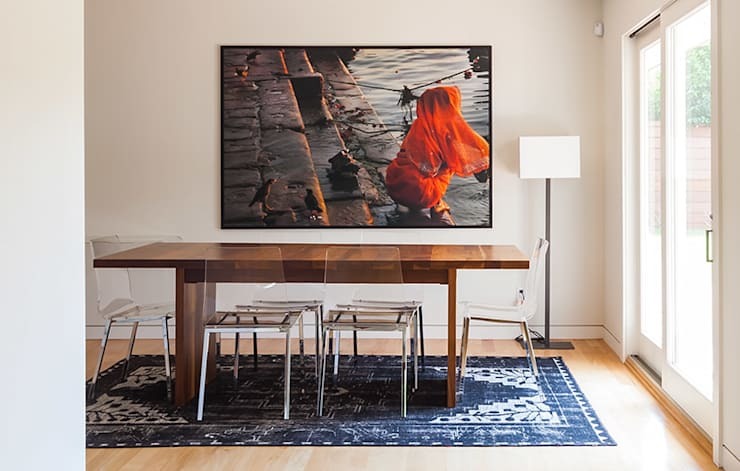 The dining room displays an affinity for the arts with an enlarged photograph acting as the centerpiece of the room. An arrangement of lightweight, transparent chairs keeps the room from feeling heavy or cluttered, giving the room a simplified, crisp look. This balanced space has a bit of everything – light and dark, polished and matte, geometric and organic. Notable is the heavily knotted wood of the kitchen table, which brings an easy-going natural feel into the clean white space. Beyond, a patio is accessed through a wide set of double doors, with a picnic table located near to the door in a convenient spot for bringing plates out for a picnic. The photographer beautifully captures the sense of optimism and clarity that fills this sunlit space, with the golden-hued wooden steps of the staircase interrupted by nothing but pure morning sunlight. 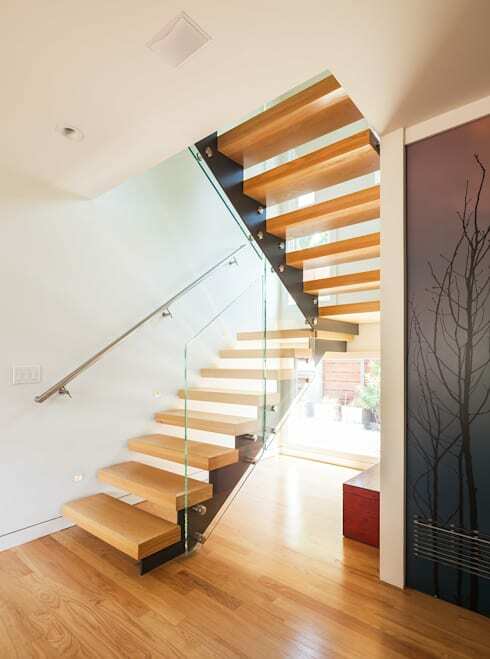 A clear bannister helps to allow the light from the window to reach the rest of the room, with a small bench taking advantage of the space left under the stairs, offering up a calm spot for a quiet read. 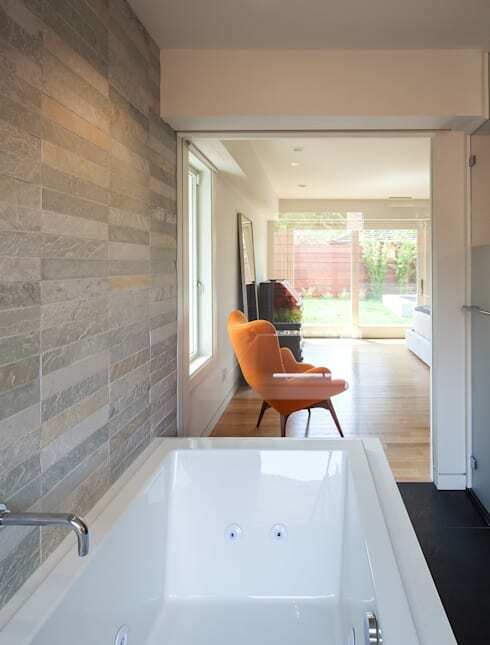 Sheltered by the reddish fence that surrounds the home, the bathroom has been given the opportunity to open up a bit. This view shows the bathtub as seen from the master bedroom, looking through a clear pane of glass to find a wood-clad tub, with views clear through to the backyard just beyond. 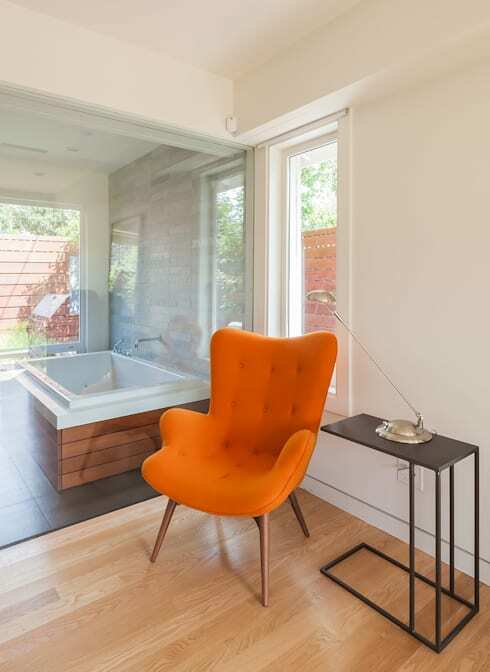 This view shows the unique sense of communication that has been established between the bedroom and bathroom, with a perky orange armchair sitting close to the transparent divider. However open and communicative this design may be, there’s still a sense of separation offered by the distinct materials used in the two rooms, with a crisp transition from black to wood flooring and a juxtaposition of stone tile and white plaster walls marking the unique personalities of the two spaces. 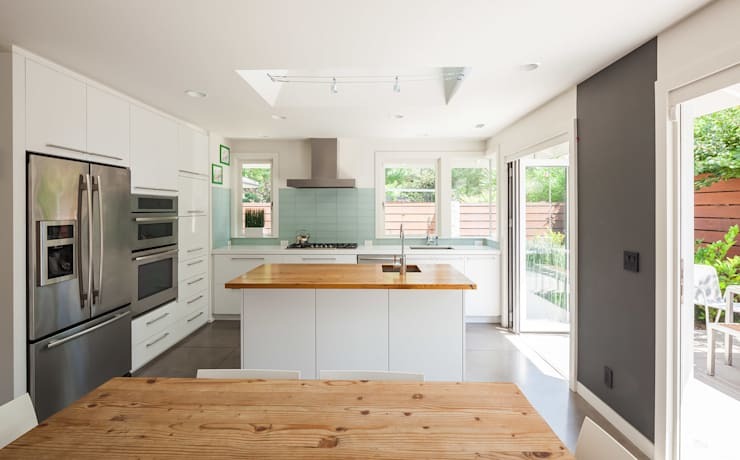 Share your thoughts on this contemporary Californian house below!